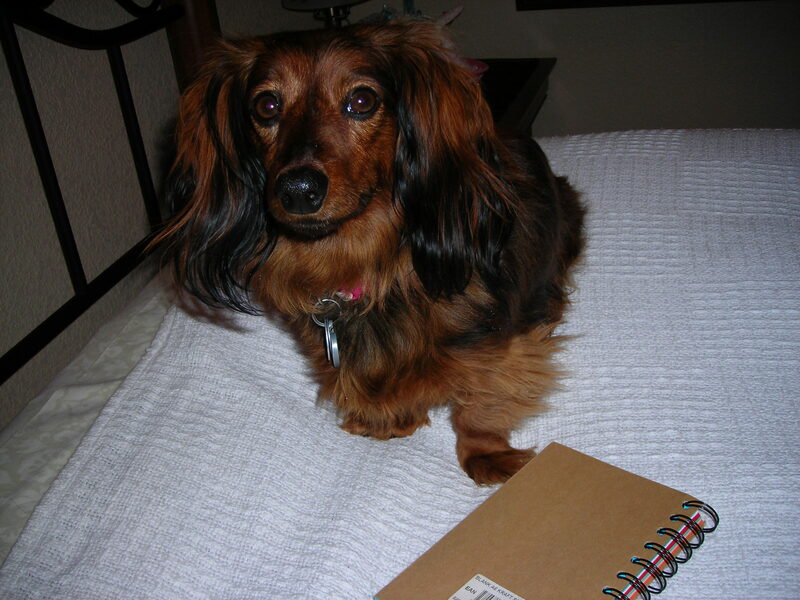 Zoey the Cute Dachshund tries her paw at writing poetry. My favorite kinds of poems are those about dogs, and my favorite books have dogs on the cover, as main characters and somewhere in the storyline. I’ve written a few poems, which I showed off last year in my blog. You can check those out (which I highly encourage) under Canine Poetry or Poetry. You may question my ability to write poetry given that I’m a dog. I can and have, plus I am working on a children’s book with me as the main character. It certainly will be a bestseller given how popular I am. Wherever I go, people want to pet me, and they say that I’m cute, pretty, beautiful and soft (I have the best fur coat from my oatmeal shampoo). 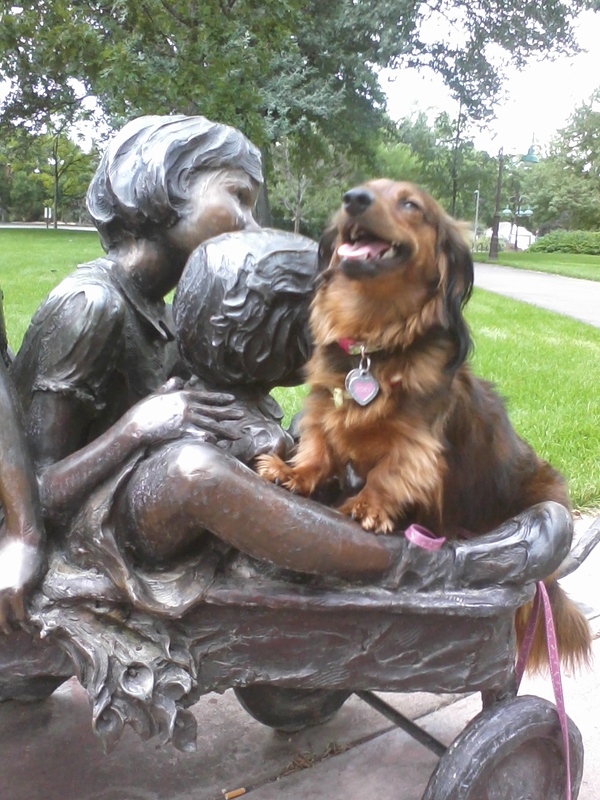 As they fawn over me, I pretty much can guess that they’re ranking my cuteness factor an 11 on a scale of 1-10. The answer is, of course, treats! 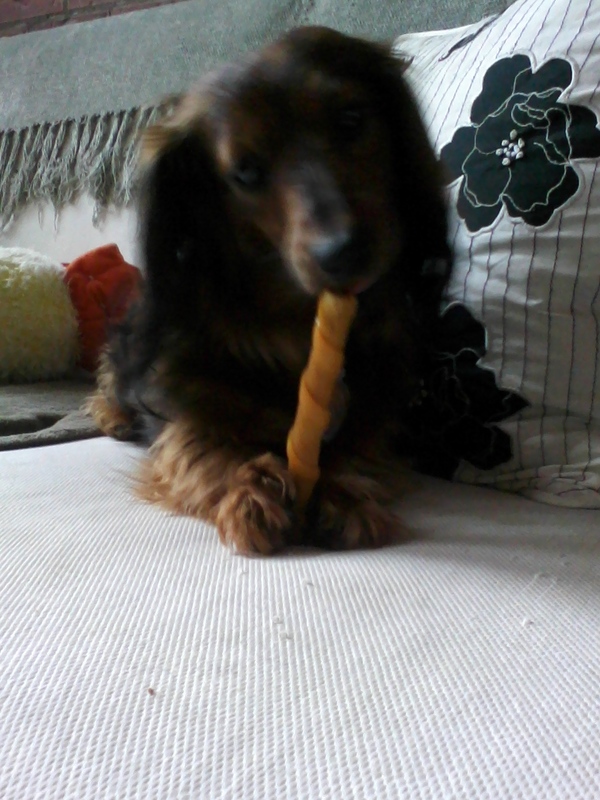 I am a cute dachshund very deserving of good food, lots of cuddles and long, extended playtime. What I’m not about is cat’s having nine lives, cats being let out of their bags and curious cats that taunt me and flick their tails in disdain. Cats and clichés, they can’t be too much of a good thing. I’ve tried to befriend ducks, too, a gaggle of three that paddled out of range every time I pulled on my leash to get closer. They honked and lifted off on flapping wings, leaving me in a barking frenzy. Oh, the life of a dog in want of friends. The problem is Shelley goes to work eight hours a day, and she doesn’t give me the keys to the outside world. She doesn’t think I’m responsible enough to lock the door with my paws and take my own self on a walk. The thing is, the writing is on the wall. 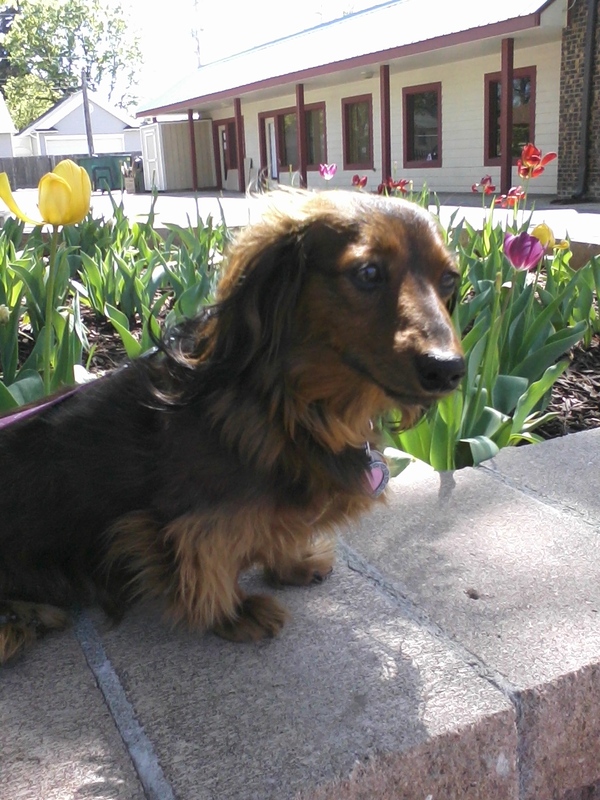 I’m a dachshund in need of attention, my moment of truth. As I go on walks where I’m leash bound, I like to stop at every passerby to see if they’ll pet me. If they’re an animal lover, I show them my belly. If they pick me up, I’ll rub my face against their cheek or give them a kiss. I’m a born lover, that’s all there’s to it. I am motivated by what should motivate all cute dogs – praise, getting pets and, of course, the T word. Shelley, my human writing partner, went on and on this week about character motivation and the difference between what a character wants and what she needs. But what I need is to get carried. I don’t like my point-of-view being so low to the ground. Up high, I can gather more information and see what’s going on without relying so much on my sense of smell. Another want/need is to run around a backyard, but Shelley does not have a backyard. Walking on a leash isn’t the same thing. Just imagine if you were told where to walk and had to follow the same old route every time your person got off work. Yeah, I thought so. Plus, I hate how when I want to sniff a smell and really understand the source and identify how long it’s been there and why, Shelley pulls on my harness. I’ve got to move along. That’s because I’m the CEO of cuteness. As CEO, I want a higher salary. But what I need is (organic) food, toys, treats, walks and LOVE. The (organic) part is Shelley’s choice, but I like my food, or all food, except for watermelon, cereal that I can’t figure out how to eat and bad-tasting stuff. I like, especially, treats, the extra good, once-in-awhile ones that are above all else. Call it eating my way into doggie heaven.